It’s the season for cosy autumnal recipes, indulgent family feasts and sipping wine by the fireside. Rioja Wine UK asked me to share a couple of my favourite Thanksgiving recipes with some suggestions on the types of Rioja wine to pair them with. I may not live in America, but I don’t see why I can’t celebrate Thanksgiving, especially when the menu so often pays homage to my favourite vegetable, the glorious pumpkin. At this year’s Thanksgiving feast, pumpkin will be taking centre stage. I’ll be serving up a whole Roasted Pumpkin with a Creamy Wild Mushroom, Sage and Gruyere Stuffing. There’s something so celebratory about bringing a whole pumpkin to the table and its melted fondue centre is guaranteed to make guests go weak at the knees. The nutty sweetness of the pumpkin pairs beautifully with the silky flavours and vanilla character of a classic Crianza (You can read more about Crianza on the Rioja Wine UK website). I’m also sharing a recipe for a Roasted Butternut, Chorizo and Goat’s Cheese Tart. Butternut and chorizo is one of those classic combinations I just can’t get enough of at this time of year. It’s the perfect tart to serve in the build-up to Thanksgiving. 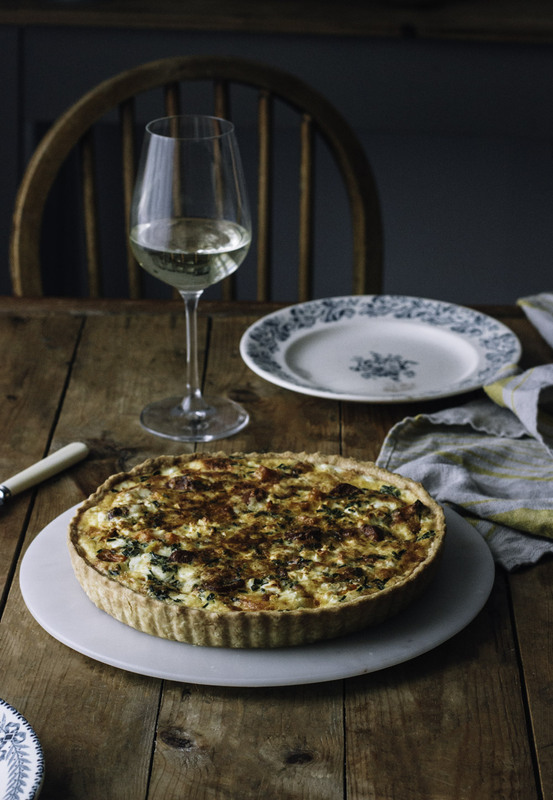 Despite the bold flavour of the chorizo and goat’s cheese, this tart is pleasingly light, and pairs wonderfully with a smooth and bright Rioja Blanco or Rosado. For more ideas on what Rioja wine to serve, head to the Rioja Wine UK Website or follow them on Facebook, Twitter and Instagram. Preheat the oven to 180C. Using a sharp and sturdy knife cut off the top off the pumpkin. Using a spoon, scoop out the seeds and string from both the lid and cavity of the pumpkin. Season the inside of the pumpkin with salt and pepper and place on a baking sheet, lined with grease-proof paper. In a bowl, combine the bread, gruyere, garlic, wild mushrooms, sage and chives. Mix the nutmeg and cream together and then drizzle over the stuffing, adding more cream if the mixture seems a little dry. Spoon the stuffing mixture into the cavity of the pumpkin, filling right to the top and squeezing down slightly. Place the pumpkin cap back on top, and season the outside with salt and pepper. Put the whole thing in the oven for roughly 90 minutes, until the pumpkin flesh is soft when pierced with a knife. You may wish to remove the pumpkin cap 20 minutes before taking the whole thing out of the oven, so the stuffing crisps up a little on top. Serve straight away, while the stuffing is still hot. Be careful when transferring to a serving platter, as the pumpkin will be very soft and wobbly. You’ll need a loose-bottomed 25cm tart case. Start by making the pastry. Combine the flour, salt and cold butter in a bowl and rub together with your fingers to form breadcrumbs. Add the egg yolk, along with 2 tablespoons of water, and use a knife to mix it together. If it looks dry add a little more water. Use your hands to bring the dough together. Wrap in clingfilm and refrigerate for at least an hour. Meanwhile, preheat the oven to 180C. Place the cubed butternut into a roasting tin and toss with the olive oil. After 30 minutes add the chorizo and continue to roast for about 15 minutes, until the chorizo is cooked and the butternut soft and caramelised very slightly on the edges. Remove from the oven and set to one side. parchment and fill with baking beans. Blind bake for 20 minutes, after which, remove the baking beans and parchment and bake for a further 5 minutes. Once baked and cooled slightly, scatter half of the grated cheddar over the base of the tart ‘s shell. Arrange the butternut and chorizo in the shell. Crumble over the goat’s cheese and scatter over the spring onions and chives. Mix the cream, eggs and salt together in a jug and then pour into the tart shell. Sprinkle over the remaining cheddar followed by the paprika and then bake in the oven for approximately 25 minutes, until the centre of the tart has set. Remove from the oven and allow to cool for 5-10 minutes before serving with a leafy salad.